Day 11....2.5 days until Valentine's Day. YIKES! 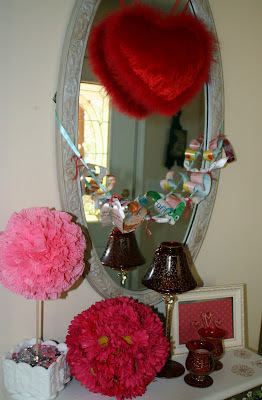 I added a little Valentine Charm to my Entryway. I'm excited that I may be able to transition this into Easter just by changing a few items! ~The heart garland I made from magazines. I have so many magazines, I hate to throw them away, so I find useful ways to use them. At Christmas, I used them to make gift bows. I found a great tutorial here at How About Orange. ~The topiary is a Cupcake Liner Ball...just Google cupcake liner ball and you are guaranteed to find just what you want. I look through the listed images when I am searching for a "how to". ~The pink flower ball is just what you are assuming...flowers hot glued to a Styrofoam ball. ~For the framed artwork, I used scrapbook paper and glued some decorative hearts to it, put it in a frame and called it art!